The optic fiber in the modern era of fiber-optic communication has its origin as wave guides in early 20th century for radio wave transmission. Application was expended to microwave during WWII. Expansion into higher frequencies in the optical range became feasible with the dielectric wave guide in the 1970s when fiber with very small diameter (the size of human hair ~ 0.005 cm thickness) can be manufactured. The reason will become obvious at the end of the following mathematical derivation. The core is a long cylinder with index of refraction n1. It is coated by a cladding with n2 < n1 to allow total internal reflection and thus minimize energy loss during the transmission (Figure 01). 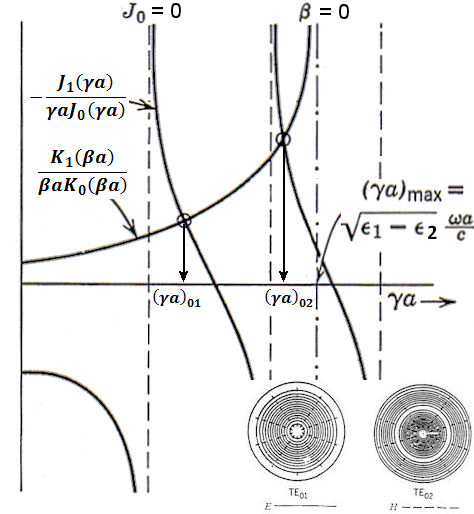 The index of refraction n is related to the relative dielectric constant (in D = E), permeability (in B = H) and the velocity in the mediuum v by n = ( )1/2 = c/v. Usually, the fiber is made of non-permeable dielectric with = 1 (for poor magnetic response). By measurement 0 = 1/(4 x9x1013) q2/N-cm2, 0 = 4 x10-7 N/amp2 in vacuum such that ( 0 0)-1/2 = 3x1010 cm/sec = c. The relative and are the ratio to those in vacuum, e.g., = i/ 0 and = i/ 0. Glass fibers are made from silica with n1 ~ 1.5 and n2 about 1% less. Such choice would produce smaller (90o - 1) range for total internal reflection, but allow higher transmission frequencies (Figure 01). 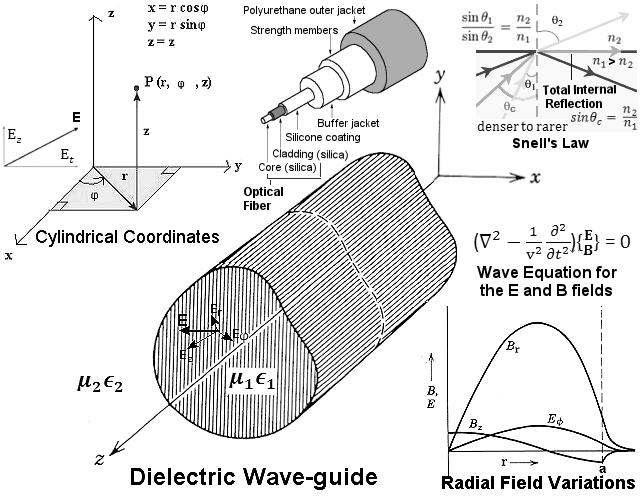 BTW the waveguide for radio transmission is made of metal, which has refractive index smaller than 1 and thus all the consideration for dielectric core is applicable as well. 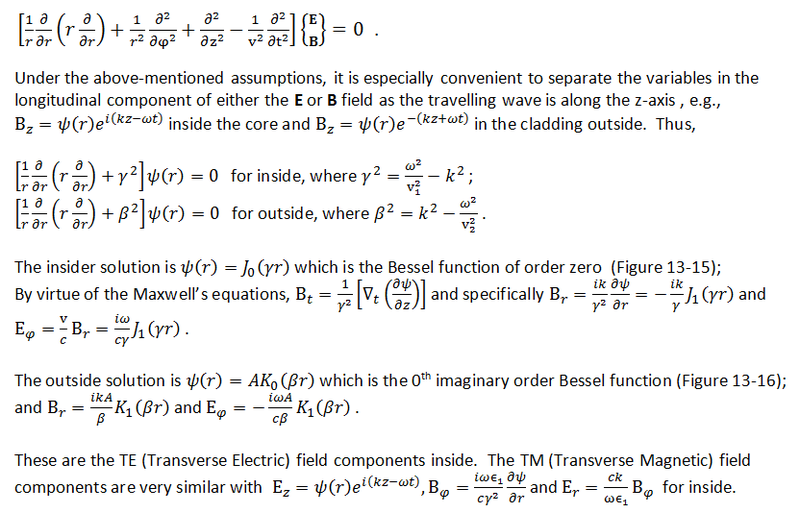 The electric field E and magnetic field B have no azimuthal variation. E = Et + Ez , where Ez = (ez E)ez , Et = (ez x E) x ez , which is the unit vector along the z-axis; similarly for the B field (Figure 01). The oscillatory solutions (inside with radius a) must be matched to the exponentially decaying solutions (outside) at the boundary to prevent energy loss. This is the condition to generate various modes at specific frequencies for "no loss" transmission. This is just the condition for total internal refraction in geometrical optics (Figure 01). BTW, the Maxwell's equations in medium after the separation of the variable t by e-i t become : xB = (-i /v)E, xE = (i /v)B, B = 0, and E = 0, giving, for example, B = (v/ )2 x xB. 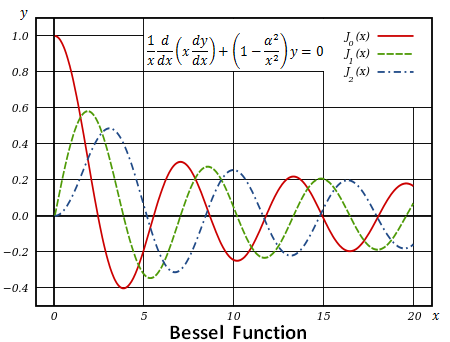 Also see Bessel Function in its various forms. The different modes are distinct by the patterns of the propagating electric and magnetic fields (see insert in Figure 04). Multi-mode fibers generally have a wider core diameter and are used for short-distance communication links and for applications where high power must be transmitted. Single-mode fibers are used for most communication links longer than 1,000 meters. Modes with azimuthal dependence have longitudinal components of both E and B. Although the mathematics is more involved, the general features are similar to the simplified case above. Fiber attenuation, which necessitates the use of amplification systems, is caused by a combination of material absorption, scattering, and connection losses. Although material absorption for pure silica is only around 0.03 dB/km (modern fiber has attenuation around 0.3 dB/km), impurities in the original optical fibers caused attenuation of about 1000 dB/km. Other forms of attenuation are caused by physical stresses to the fiber, microscopic fluctuations in density, and imperfect splicing techniques. The unit of attenuation is decibels/kilometer (dB/km) defined by (10/L)log10(Pi/Po), where L is the length of the fiber cable, Pi and Po the input and output of the optical power respectively. It has been estimated (by Charles K. Kao) that successful fiber optic communication can be achieved only when the attenuation is below 20 dB/km. While the data rate in optical fiber can reach 275 Gbps per channel and up to 100 Tbps with the Wavelength-Division-Multiplexing (WDM) technology, this is usable only in FTTP which installs the optical fiber all the way into the premise. Most household would receive a service of 25 - 1000 Mbps even with the new VDSL modem because it is very difficult to convert all those copper wirings inside the older buildings (Figure 05). A solution for the problem of wiring is to install a repeater/extender/booster/access-point, such as the VAP3400 from Arris (formerly Motorola) to increase the coverage area of the WiFi network. It works by amplifying the WiFi signal and then re-transmitting it with boosted up strength. It could double the coverage area of the network - reaching far corners of the building, different floors, and onto the backyard. Figure 06 shows two different configurations. Each case requires a TV receiver (such as the VIP2502W) or a Set-Top Box to pick up the signal. The technology enables novel deployment of IPTV, which streams the source media continuously. It seems that as of 2016, only customers live in Montreal, Quebec City or Toronto with Fibe TV can install such option. 4K UHD means Ultra-High-Definition at resolutions of (width x height) 3840 x 2160 pixels (thus ~ 4K x 2160 p) vs HD at 1920 x 1080 p.
Usually, the signal travels through the optical fiber at about 30% of the speed of light. It is reported in 2013 by "ExtremeTech" that a team at the University of Southampton has managed to make fiber cable that can transmit signal at 99.7%. Latency is the delay caused by softwares and hardwares along the way; it is normally in the range of 10-3 sec. For broadcasting through the air, Bell's Home Hub 3000 modem transmits the signal wirelessly with 5 GHz and/or 2.4 GHz frequency at corresponding wavelength 6 and 12 cm (see comparison between them) . 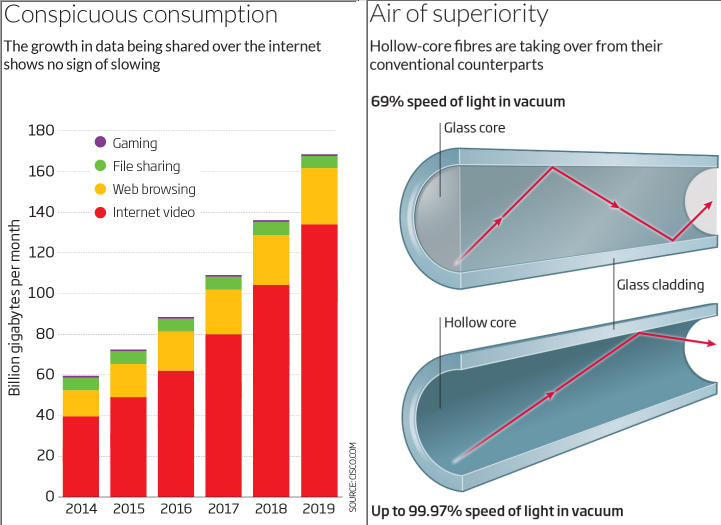 As the use of fiber optics for data transmission over the internet has been skyrocketed especially for video viewing (Figure 07), the capacity of conventional optic fiber would reach its limit by 2020. There are upgrades to pump more data through existing fibers as summarized below. Eventually, it would have to be replaced by an entirely new design. At present, one fiber can carry up to 160 laser beams with different frequency. The beams start to interfere with each other as the number increases. Software can be programmed to correct the distortion until the lasers become powerful enough to melt down the fiber. By planting an optical conjugator halfway along the fiber, the distortion can be corrected by itself at the end. The problem is with variable length which requires a large amount of implementations. Twisted light beams provide more ways to encode data depending on its twisted appearance. The number of patterns is potentially infinite, but it is still in experimental stage. Ultimately, the unlimited demand could be radically satisfied by re-designing the fiber with a hollow core. There will not be total reflection (Figure 08), the glass cladding instead has to be micro-engineered - a difficult process that involves etching intricate marks onto the inner surface. Paradoxically, the cost would be reduced because the quality of the glass could be lowered to those among the everyday variety. Since there would be no total reflection in this case, the fiber has to be constructed such that the incident angle is close to grazing (~ 90o) to maximize reflection (Figure 08). As shown in Figure 08, the reflection coefficients of both the and polarized beams attain the maximum value of 1.0 at 1 = 90o. The formulas for the reflection and transmission are also shown in the same picture. These are just the amplitude, the total intensity is the squared sum (Figure 08). 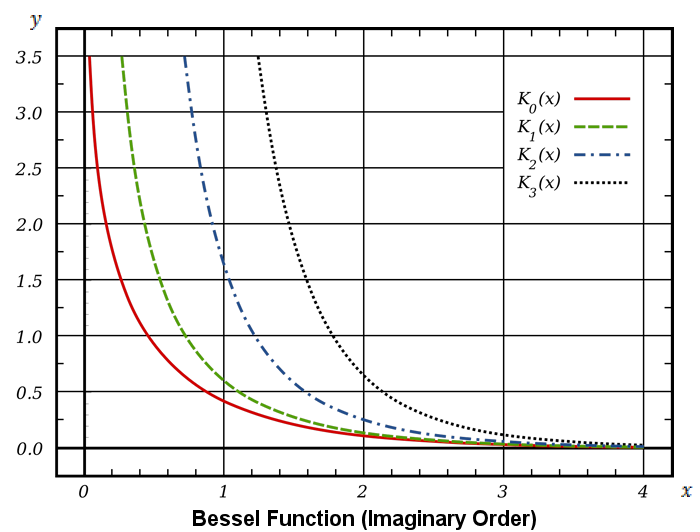 The formulas can be expressed as a function of 1 by using the Snell's Law, also taking into account the narrower flux size for the transmitted beam in calculating the intensity. Theoretically, the value should be 1 (relative to the incident intensity) in case of no absorption and internal reflection. The Brewster's angle is unique for transmission, which becomes total at that angle making the reflected beam polarized from un-polarized light.